Do you imagine, as I do, that there’s a wonderful Wizard somewhere who, after much pondering, deems that eggplant accents and Italian glass tile are in? I can’t help but think so after indulging in list after list of design trends for this year; there’s simply too much overlap to be coincidental. If you’re in the midst of planning a bathroom remodel, here are my favorite ideas from the Great Wizard of style trends. Houzz editor Sheila Schmitz tells Details Magazine that black has replaced grey as the go-to color of the year. My take on this trend for the bathroom: how about an elegant or fun black accent in the bathroom. I will be experimenting with black chalkboard paint in our guest bathroom this year. Looking forward to parties where guests can leave notes on the wall. In a similar vein, Paste Magazine suggests deep hues like rich purples and blues. Why not? You don’t have to install a shower full of purple tile, but you could hang a painting or use an accent tile. Elle Décor suggests a rich turquoise. 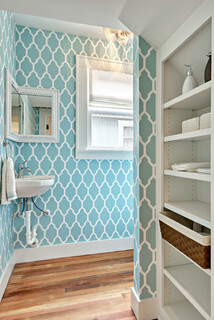 Who doesn’t love a bathroom with a little seaside charm? I’ve seen a lot this year about natural wood grains, butcher block counters, and honey-colored woods. I love wood in the bathroom. Just be sure you know how to care for it. Some of it requires regular maintenance, and if you’re not up to it, then I’d opt for an easier solution. Style at Home has a whole set of design trends just for the bathroom, but my favorites are matte tile and built-in ledges and seating. Matte tiles are an easy way to create texture and movement no matter your color scheme or style preference. Style with a purpose is kind of ideal, isn’t it? The practical person in me likes built-in ledges and seating, while the designer in me appreciates that a built-in ledge trimmed in wood, for instance, can be an eye-catching and fairly easy detail to add a little panache. Another trend appearing in several places (Wizard, we know you’re there!) is to break out your family heirlooms or artwork to make your space uniquely “you.” In my bathrooms, I have pieces of artwork from friends, but you could just as easily work with abstract photos or even a child’s canvas artwork. Careful with the humidity: some art won’t stand up to the bathroom environment. Use only those things that you won’t cry over if they get ruined. I opt for ceramics and photos that I can reprint. Now, I’m off to the paint store. That turquoise is so inspiring!